As part of its commitment to community service, student-run WSOU 89.5 FM at Seton Hall University continued its annual participation in the “Students Change Hunger” program, collecting more than 350 pounds of food for the Community Food Bank of New Jersey. WSOU became involved with Students Change Hunger because of the tremendous need in the market the station serves. In New Jersey alone, more than 1.3 million people require food assistance. When New York City is factored in, many people within WSOU’s coverage area are impacted by not having enough to eat. 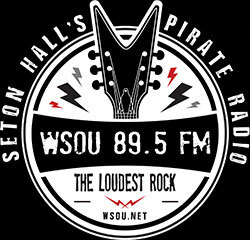 WSOU’s donation of food was brought to the Community Food Bank of New Jersey Headquarters in Hillside, N.J. on Dec. 21. For more information about the Community Food Bank of New Jersey and how to help, visit www.cfbnj.org. Photo Caption (l to r): WSOU staff member Katherine Rossi and New Director Jocelyn Rogalo with some of the more than 350 pounds of food Seton Hall University’s student-run radio station collected during the station’s annual food drive for the Community Foodbank of New Jersey.